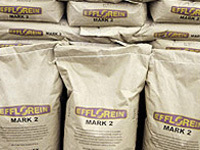 abilox® and duro® colours, admixtures Efflorein® Mark 2, abil-strength® and abilspray®, easy mixing powders are packaged in Ability’s Concrete-Friendly® sacks which are bio-degradable bags that are simply added into a concrete mix without having to be opened or poured. These are water sensitive, (ie: have a low wet strength) and disintegrate when water saturated and fully mixed into the concrete, leaving no bags to dispose of into the environment with even the stitching dissolving! Ability has developed these unique products in response to both Industry needs as well as addressing environmental concerns.